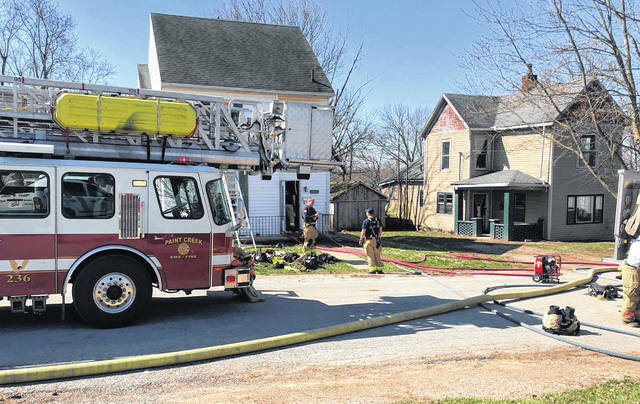 There were no injuries and damage was kept to a relative minimum Wednesday when fire struck a home on Uhrig Street as electrical work was being done, officials said. Lt. Branden Jackman of Paint Creek Joint EMS/Fire District told The Times-Gazette that the fire began in the home’s crawlspace and crept up into the walls. Had crews not arrived on time and doused the fire, Jackman said, the home would have been substantially damaged due to the construction of the walls. Crews had to cut a long hole in the floor of the living room and rip out a portion of the wall to access the fire and extinguish it, according to Jackman. Jackman said electrical work was being done at the time of the fire, but the cause of the blaze is not yet determined. Shown in the photo are firefighters Robbie Miller and Tyler Coleman.